I have to admit that January is a blah month. After the holiday season filled with great food, parties, friends, and family, the cold and snowy days that come after seem to drag on. So, on an impulse, I decided to get out and try a new restaurant! 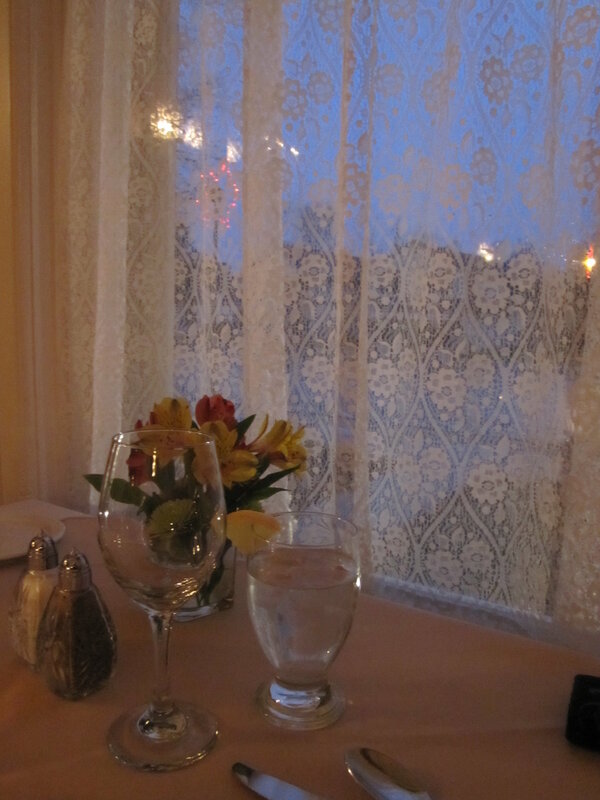 I headed to Thyme on 21 in Goderich for dinner. I had never been there before, and I had heard some great reviews from my coworkers. The restaurant is located in a beautiful Victorian home along Highway 21 in Goderich, just a block away from the historic square. First off, the service was excellent. I was greeted by the host and had a nice chat with him about the history of the property. He lead me to a nice spot by the window across from the fireplace. And when leaving, he even helped me put on my coat! Small touches like that really enhance the experience. The server, Michelle, was very friendly and courteous. The decor inside is rustic and regal, and it makes for a very intimate atmosphere. While this is a great spot to eat anytime of the day, I really think this restaurant would be a great pick if you’re looking for a romantic evening for two. The most important part: the food! Everything was very fresh and tasty. The portions were just right: not too big and not too small. I had the smoked salmon for an appetizer, which was accompanied with dill mayo, red onion, capers and fresh baguette slices. This was something I normally wouldn’t choose, but it fit my criteria: try something I usually wouldn’t make at home. It was a great choice! For the entree, I had the special of the evening which was the beef skewers with hoisin sauce along with rice pilaf and sauteed veggies. To top it off, I had carrot cake for dessert. I have to say this had to be one of the best meals I’ve had in a long time (at least since those fantastic homemade Christmas dinners!). I will definitely be back again.